This is a pretty single barreled gun in decent condition for its age – the action is quite tight. Serial No 2772 – it would appear that Lang didn’t stick to a single serial number sequence. The later centrefire Lang 14 bore is serial number 2012. This gun has the Lang single bite ‘inert’ closer, which was used on the first English breech loaders to gain real popularity amonst sportsmen around 1859. 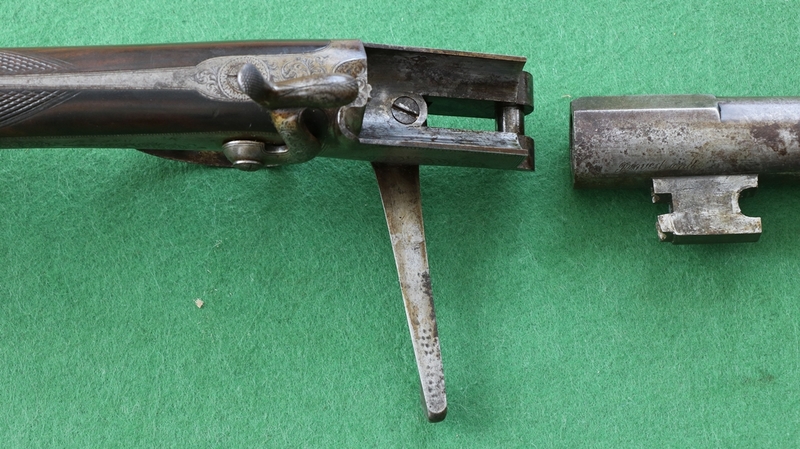 It has the problem that all the first break-open breechloaders had in that the bolt that acts on the barrel lump to hold the barrel against the action is close to the hinge pin, thus magnifying any wear in the bolt or lump, although this gun is obviously little used and is as tight as a nut. Being a single barreled gun it has a wrap round action body that is very rigid so it doesn’t suffer from the early defect of the double barreled guns that had a rather skimpy action flat that could be liable to flex under heavy loads – the forces involved were not initially well understood. Lang never patented this action. The barrel has, in script “proved and finished by” either side of the lump but the name was never added.